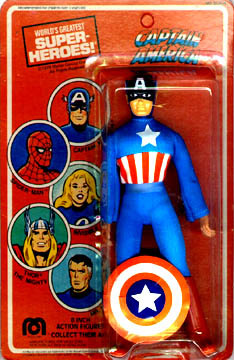 Released in the fall of 1973 along with Spider-man Captain America was one the most enduring Marvel characters produced by Mego. His appearance is not entirely comic accurate, Mego seemed to miss his red gloves and white sleeves. This may have been to due to general expense of producing the figure to begin with. Combining his shield with his already ornate costume probably made it important for Mego to cut some frills to make him cost effective. Every penny can count in production. 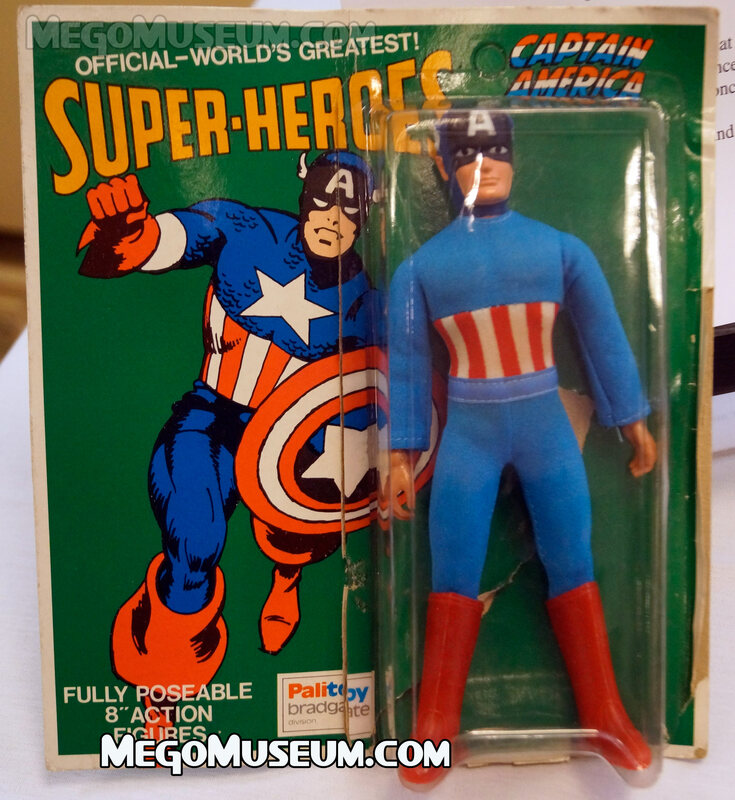 Captain America received a lot of respect at Mego, his figure was featured in every WGSH assortment from his inception in 73 until 1982. 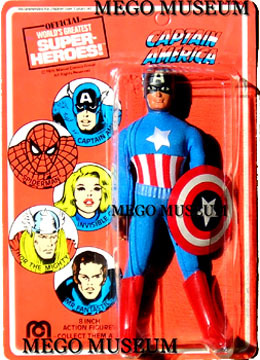 Mego even issued a Captain Americar in 1976. The picture above shows the many variations that you encounter when you produce the same figure for nine years (courtesy of Tom). 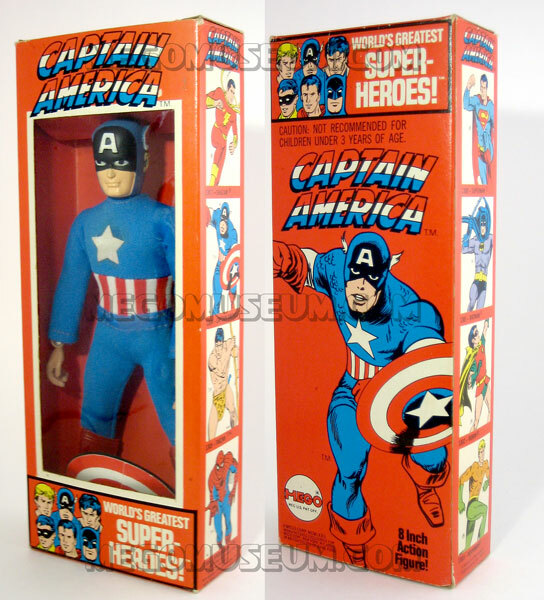 Above are the two styles of Captain America Window Boxes (note; There is no solid box for Cap) The left shows the early mingled header artwork, Mego chose to use Cap instead of Spiderman for their early headers. On the right is the revised “Marvel Only” header. The back features a swipe from a classic Jack Kirby issue of “Tales of Suspense” read more about it at comic book origins. 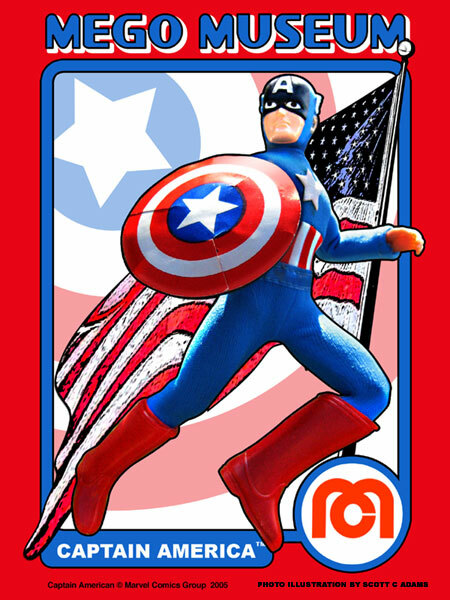 Captain America on the early style Kresge card, there is also a variation of this card that only shows the Cap and Spidey on the header. It’s interesting to note that these are the only two Marvel heroes that appeared on Kresge cards. This suggests that Kresge cards were produced from 1973 to early 1975. 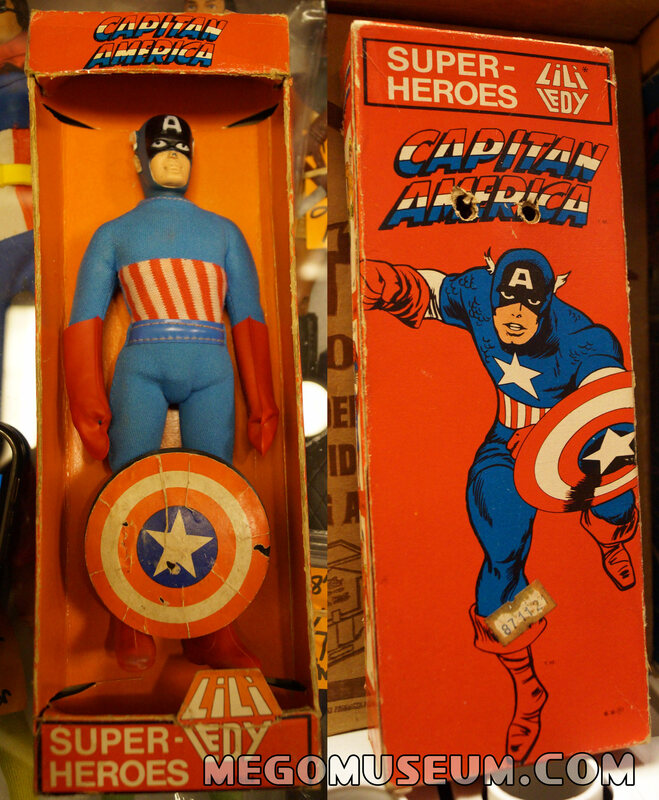 Captain America on his US cards, on the left is the 1975 “Scowly card”, on the right the 1979 “Smiley” card. Note the subtle differences in color on these cards. courtesy of Scott Arendsen. Mexico’s Lili Ledy produced a great example of Cap, there are only 3 boxed examples! courtesy of Mark Huckabone Heroes West Coast. The Mexicans gave Cap red gloves, smart looking! We’re elated to add this rare Palitoy Green Carded Captain America to the Mego Museum. This example courtesy of our friends at Heroes West Coast is only the second we at the Museum have seen in the last 18 years. For more information on the Fist Fighters see their exhibit page! 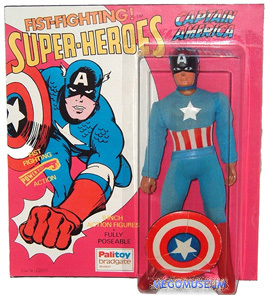 More Captain America figures were produced in other formats by Mego. 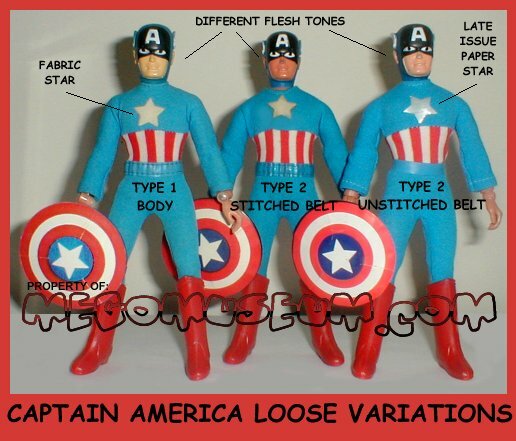 Of particular note would be the Pocket Heroes, Bend N Flex and the Comic Action Heroes lines. There are a lot of high quality homemade emblems out there, but Doctor Mego’s in the only factory made version. It’s a paper die cut. 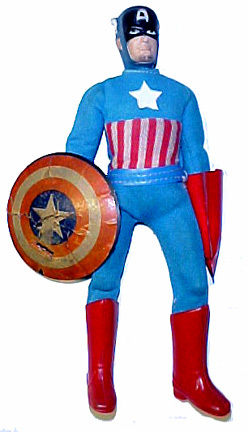 Original mego Cap never came with a paper emblem, only cloth and felt. 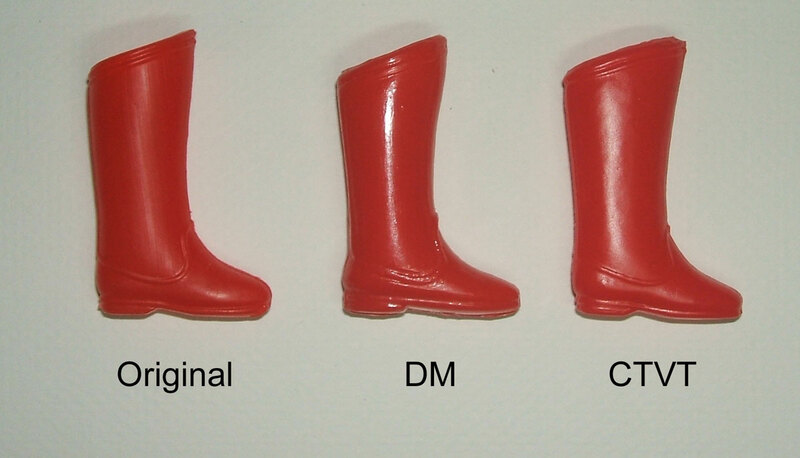 Both DM and CTVT have made boots. DM’s are a thicker plastic, more round around the edges and stamped DM on the bottom. CTVT’s are closer in thickness but are also slightly different in shape. They are unmarked. 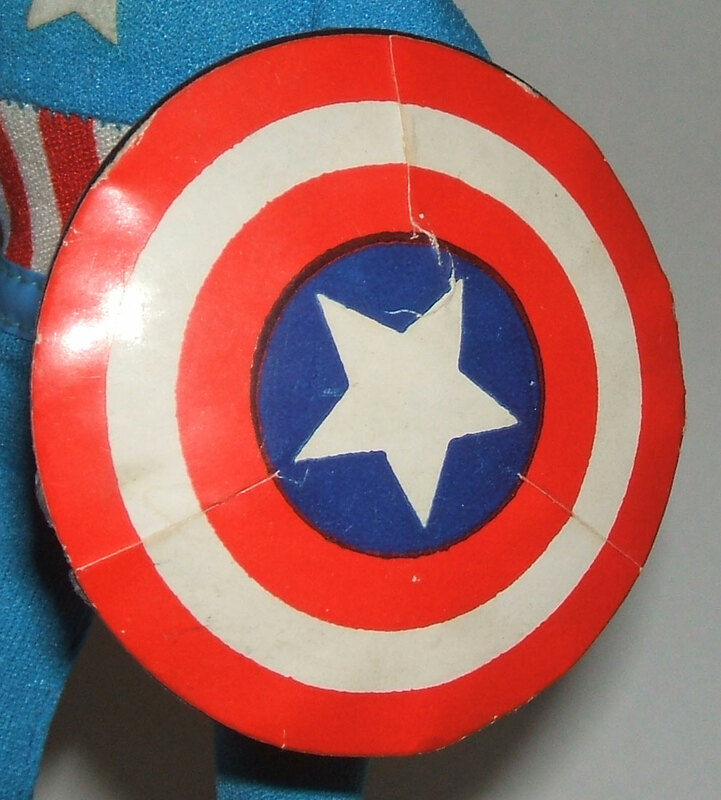 Cap’s shield is black plastic with a sticker on the front. 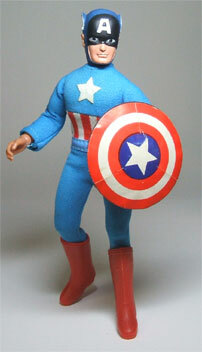 There are some nice looking, in scale blue plastic shields from another line out there that can be mistaken for mego. There are no factory made reproductions available, but there are a lot of high quality home made stickers for the shield that have been made. More common than a repro shield, is an original shield with a new repro sticker. An original mego sticker looks kind of rough. The print quality is a little fuzzy around the edges, and the sticker itself doesn’t lay perfectly smooth on the shield. This can lead one to think they have a reproduction, when in fact, they have the real deal. Original shields comes with both a glossy and a flash finish.